The boss of John Lewis has said the company's board may have to drop the annual staff bonus as the retailer battles challenging trading conditions. Around 83,000 staff are usually awarded the payout in March, but the retailer said on Thursday it expects profits to be "substantially lower" this year amid slower sales growth. Chairman Sir Charlie Mayfield told ITV News oversupply of physical retail space, and softer consumer demand due to Brexit-related uncertainty have created challenging circumstances for the sector. "Every year there is the possibility of no bonus," he said, adding the board would have to make the decision in March - the month when the UK is supposed to be leaving the European Union. "We are just flagging that the board, as it always does, has to take into account the conditions that we find ourselves in, in March," he said. The bombshell announcement came alongside the firm’s Christmas trading update, which saw the department store chain book like-for-like sales growth of just 1% in the seven weeks to January 5. While fashion, beauty and womenswear performed well, the firm said profit margins remain under pressure in what is an "intensely competitive pricing environment". Comparable sales at sister chain Waitrose rose by only 0.3%, despite a sharp reduction in the level of promotions. 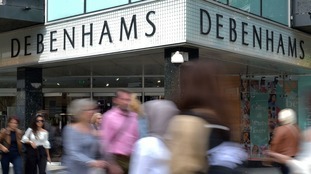 Meanwhile its rival Debenhams served up another set of dismal results, recording a 3.4% decline in like-for-like in the six weeks to January 5. The department store chain's chairman, Sir Ian Cheshire, is to step down with immediate effect after two major shareholders voted against his re-election to the board. The struggling chain's chief executive, Sergio Bucher, was also not re-elected to the board as a result of the votes of the same two shareholders. In contrast, Tesco has emerged as a festive winner after unveiling a strong set of Christmas trading figures. The grocery giant posted a 2.2% rise in UK like-for-like sales in the six weeks to January 5, outperforming the wider market in all key categories - food, clothing and general merchandise. Across both the UK and Ireland, comparable sales were up 2.6%. Tesco said its "Festive 5" Christmas vegetable offer proved particularly popular with customers, selling 19.7 million units over the three weeks to Christmas. Promotions on lamb and beef joints also helped drive sales. Chief executive Dave Lewis said: "As a team we have achieved a lot in the last 19 weeks. "In the UK we delivered significant improvements in our competitive offer and this is reflected in a very strong Christmas performance which was ahead of the market." Meanwhile, Marks & Spencer has insisted it is seeing "encouraging early signs" despite further falls in clothing and food sales over its Christmas quarter. The retail bellwether said like-for-like clothing and home sales dropped 2.4% over the 13 weeks to December 29 while comparable food sales fell 2.1%. Total clothing and home sales fell by 4.8% as it was knocked by a raft of store closures under its overhaul. The group said while unusually warm weather and falling consumer confidence made for a "very challenging" November, overall trading in its third quarter was "steady with some early encouraging signs". M&S also confirmed it remained on track for its full-year profit guidance. Chief executive Steve Rowe said: "Against the backdrop of well-publicised difficult market conditions, our performance remained steady across the period."